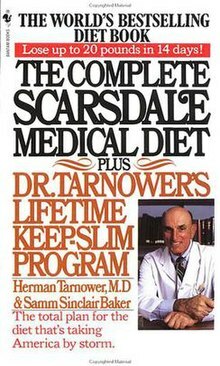 The Scarsdale diet is a fad diet designed for weight loss created in the 1970s by Herman Tarnower, named for the town in New York where he practiced cardiology, described in the book The Complete Scarsdale Medical Diet plus Dr. Tarnower's Lifetime Keep-Slim Program, which Tarnower wrote with an author of self-help books, Sam Sinclair Baker. The diet carries potential health risks and does not instill the kind of healthy eating habits required for sustainable weight loss. The diet is similar to the Atkins Diet in calling for high protein and low fat and low carbohydrates, but also emphasizes fruits and vegetables. The diet's high fat ratio may increase the risk of heart disease. People following the diet can lose much weight at first, but this loss is generally not sustained any better than with normal calorie restriction. The book was originally published in 1978 and received an unexpected boost in popular sales when its author, Herman Tarnower, was murdered in 1980 by his jilted lover Jean Harris. A made-for-tv movie, The People vs. Jean Harris, capitalized on the infamous murder, and was broadcast in 1981. Jean Harris was portrayed by Ellen Burstyn. ^ a b Anthony Haden-Guest (March 31, 1980). "The Headmistress and the Diet Doctor". New York Magazine. ^ Swartz, Jacqueline (March 15, 1982). "The sense and nonsense of the best-selling diet books". Canadian Medical Association Journal. Canadian Medical Association. 126: 696–701. PMC 1863236. PMID 7066828. ^ a b Alters S, Schiff W (22 February 2012). Chapter 10: Body Weight and Its Management. Essential Concepts for Healthy Living (Sixth ed.). Jones & Bartlett Publishers. p. 327. ISBN 978-1-4496-3062-1. This page was last edited on 4 February 2019, at 21:23 (UTC).